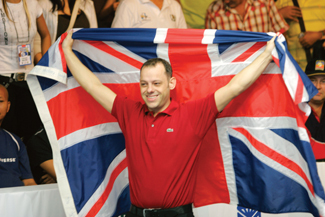 English 8-ball ace Darren Appleton conquers 10-ball at the world championship in Manila. With only a short, straight-in 10 ball waiting to be pocketed, and knowing he was about to be crowned the first-ever world 10-ball champion, Darren Appleton felt a flood of emotions sweep over him. So, instead of quickly downing the striped ball and beginning the celebration with his mates in the crowd, the Englishman coolly traipsed back to his chair, took a sip of water, toweled down his cue, and tried to take in the enormity of what he was about to accomplish. "I had to take a step back because I was getting emotional," Appleton said moments after defeating Taiwan's Wu Chia-Ching, 13-11, in a brilliantly played final and claiming the inaugural World 10-Ball Championship in Manila. The title carried a $100,000 prize. "I knew I was going to make it," he said. "That's why I went back to the chair. And I said to myself, 'I've waited 16 years for this.' And I just wanted to enjoy the moment. When I potted the 10 ball, there were mixed feelings - joy, looking back on my disappointments, two English 8-ball finals. I was ranked No. 1 in the world for six years but I never won the world championship. I just can't get my head around it. Unbelievable." For the 32-year-old Appleton, the victory completed an amazing odyssey through the sport of American pool, which, incredibly, he played for the first time barely three years ago. For 14 years he was among the top English 8-ball players, winning more than 200 tournaments, and holding the No. 1 ranking for six years. With the advent of the International Pool Tour in 2006, the promised millions lured him to American pool. He did well on the rich but short-lived tour and used the winnings to travel the world and immerse himself in the sport. Perhaps the most significant period came just after he had taken up the game in 2006. "I said to myself I have to go to the Philippines," Appleton said. "The first time I came here I stayed for three and a half months. I was in the clubs playing money matches against Lee Van Corteza, Antonio Gabica, Jehrome Pena, Gandy Valle. I just played money games after money games after money games. I was learning and learning and learning. I got a bit of coaching off of people like Efren Reyes as well. "It was the first time I ever played this game [10-ball]. And when I played it, I said, 'What a game.' It's a lot more skillful than 9-ball. It's a game where you've got to play pretty good safeties. You're not guaranteed a shot after the break. It's a true test of skill."